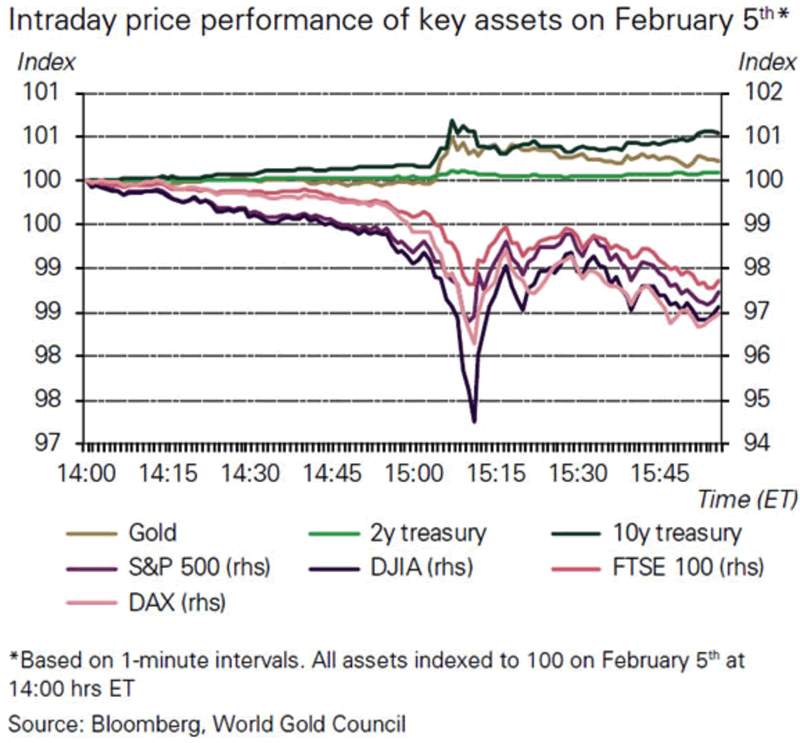 A recent World Gold Council (WGC) study has concluded that the market selloff on February 5th made the case for gold as both a diversifier and an asset that protects portfolios during market downturns. The stock market selloff of early February saw stocks tumble. But, whilst it was sharp it was also short-lived. Many watching the gold price were disappointed to see gold lose around 0.8% of its USD price between February 5th and February 12th, when both the Dow Jones and European stocks and begun to recover losses. Yet to judge gold on its price performance alone is to misunderstand gold (or, in fact any asset’s) role in a portfolio. In order to appreciate it’s performance one must compare it to other assets as well as it’s long-term behaviour. Whilst gold did drop by nearly 1% in USD terms it was a different story for other currencies (which account for 90% of gold demand). This was particularly the case in Europe where currencies weakened against the dollar, increasing gold prices. In euro terms old rallied by 0.9% and 1.8% in sterling, between Friday February 2nd and Monday February 12th. 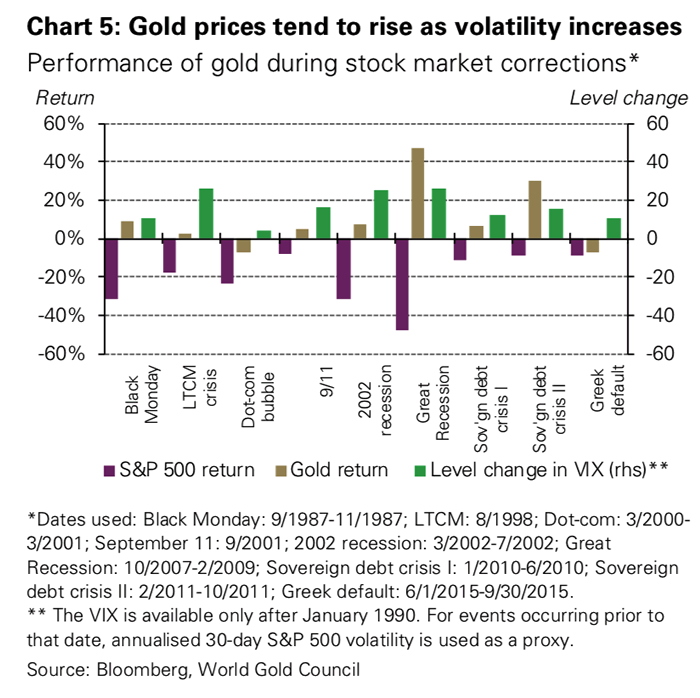 Gold and stocks are inversely correlated in market downturns. This is thanks to the behaviour of investors who typically show a ‘flight-to-quality’ behaviour. This benefit of gold is better seen when market crises are broader or last longer than the stock market correction we saw in February. Examples include Black Monday, the 2008–2009 financial crisis and the European sovereign debt crisis (Chart 5). But there are exceptions. Gold has been more effective as a hedge when a market correction has been broader (i.e. affects more than one sector or region) or lasted longer. During the 2001 dot-com bubble burst, the risk was mainly centred around tech stocks and was not enough to elicit a strong reaction from gold; it was not until the broader US economy fell into recession that the gold price responded more sharply. Similarly, investors outside of Europe discounted the possibility of a spill-over from the 2015 Greek default. In recent pullback, as stocks quickly rebounded, gold’s reaction was more muted. However, taking a longer, more strategic view, is quite relevant. As we often discussed, mainstream media and market commentary have a strong bias towards short-term views. This leads to a very blinkered approach and often an all-too-easy dismissal of gold as a worthy investment. There has been talk of a stock-market correction for a long-while. Frothy asset prices, pumped-up valuations and the ongoing uptick in stock market prices appeared to be just asking for a market selloff. We finally saw a selloff last month when the DJIA had it’s biggest drop in history. Was this the end of the bubble? Prices did recover but that doesn’t mean it wasn’t the final bell in what has been a long run. An environment is now forming where a number of corrections are becoming more likely in the near-future. Interest rates are slowly being hiked up, how markets and economies will cope with this after a record-long period of ultra-low interest rates is something we are just beginning to get a taste of. 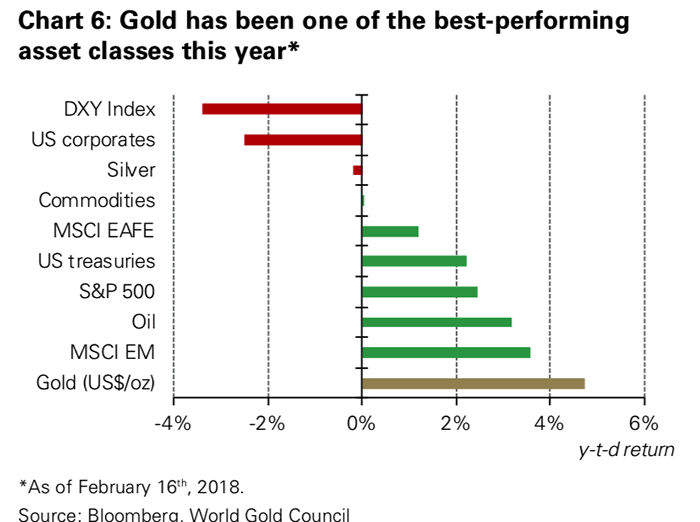 So far, 2018 has been a good case in point of gold’s role as a strategic asset. It has been one of the best-performing asset classes year-to-date, besting treasuries and corporate bonds (Chart 6). It has served as a diversifier and liquidity source as stock markets tumbled. Thus, gold helped investors improve their portfolios’ performance. You can find out more about investing in gold as part of a diversified portfolio in our Comprehensive Guide to Investing in Gold. All quotes and charts taken from the World Gold Council.